Today marks the death of the Canadian penny. Soon to be eliminated at the POS. Born in 1876, at the ripe old age of 137 years old, the iconic Canadian penny with its maple leaves and Queen’s Head has been euthanized by the Canadian government and will eventually fade out of our national identity. Not enough to even buy penny-candy anymore but occasionally worth more than an American penny, we say goodbye to the familiar copper coin. Why? Manufacturing the penny is too expensive apparently. Each penny costs the government 1.6 cents to produce. It is estimated that the government will save approximately $11 million per year in not producing pennies. This may seem like a lot of money on its own, but when compared to a $300 billion annual budget, $11 million seems like a drop in the bucket. When you factor in what it will cost the government to collect and recycle the pennies, they are only expected to net about $4 million a year in savings over the next 6 years. By any definition this is definitely a long-term cost cutting measure that will have little or no impact on the national budget, tax payers or consumers. That’s all fine and dandy, but how will it affect you, the merchant, at the POS? Retail and restaurant merchants have been suspicious – and rightly so – of some of the information being reported in the press about how much will be saved and how easy it will be for them to make the change. The government and the media alike just don’t seem to be able to comprehend the evolving challenge of customer service and POS transactions – very little of their coverage of the issue seems to be relevant to the perspective of the retailer or restaurant owner. So here is what you need to know about the end of the Canadian penny and how it will impact you – the Canadian Merchant. Pennies will be around for a while. The Royal Canadian Mint will stop distributing pennies – stop sending them to Canadian banks – today – on February 4th, 2013. That sounds ominous, but there are 35 billion pennies in circulation. Even if banks start vacuuming them up out of circulation immediately and ship them directly to the Canadian Mint to be destroyed, it’s going to be some time before they don’t exist at the POS. I’m also not certain what the banks will do with the pennies when they receive them. Although the Canadian Mint will not issue pennies to the banks, banks are not required to redeem pennies with the Mint. Merchants are worried that they will go to the bank after February 4th and not be able to get pennies. Bank tellers that I have asked have not known what will happen after February 4th, and I have not seen any documentation of the plans of the 5 major banks regarding the penny, nor is there any requirement in the legislation requiring banks to turn them in to the government. I think that if the banks have the pennies they will issue them. On February 5th I’m going to go to the bank to buy a roll of pennies and we’ll find out. Stay tuned. Should we accept pennies at the POS after February 4th? Absolutely. 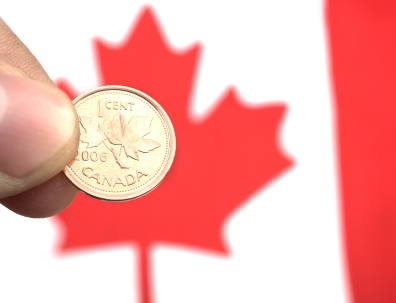 The penny will be legal tender in Canada indefinitely – a fancy word meaning, forever. Canadians should be very familiar with the government eliminating currency from circulation. Back in 1989 we eliminated the Canadian one dollar bill, and then again in 1996 we eliminated the two dollar bill. It’s now 2013 and we can still can take those bills to the bank and redeem them for a looney or a twoney. Have no fear, the Canadian penny will always be worth a penny at the POS in Canada – period. Should we give out pennies at the POS after February 4th? If you have them to give – sure. Why not? They are and will continue to be legal tender. Your customers can take them to the bank and turn them in for 1 penny worth of value. As long as you can get them and give them, you can use them at the POS. What do we do when there’s no penny to use at the POS? The Canadian government has proposed that retail and restaurant operations should be rounding off to the nearest nickel in a fair, consistent and transparent way at the POS. This leaves lots of room for interpretation. What has been the general consensus is that retail and restaurant operations will round to the nearest nickel – if the transaction ends in 1, 2, 6 or 7 they will round down, and if the transaction ends in 3, 4, 8, or 9 they will round up. You should also round refunds in the same manner. Do we round off all transactions at the POS? No. Only the change due on cash POS transactions is subject to rounding. The penny is and will remain the smallest denomination in currency in Canada; there just won’t be any cash pennies anymore. That means that all transactions paid by cheques, Visa, MasterCard, American Express, Gift Cards and Debit will not need to be rounded. If you’re rounding off electronic payments and cheques – you’re doing it wrong. Should I round off all my prices to the nearest nickel? No. I have heard of people doing this, and it is unlikely to be a good strategy. When tax is calculated on a transaction at the POS the result is random depending on how many items you have in the transaction. Are there some businesses that can modify their pricing to avoid losing pennies? I have no doubt that there are, but those businesses need to consider the ramifications of customer perception of a price change made in concert with the penny change, whether or not the cost to modify is worth the cost of rounding, and the inevitable unintended consequences of a well-intentioned policy. Will the elimination of the penny cost my business money? This is really the only question that anyone in retail and restaurant cares about. Ultimately, people are worried about the potential cost that penny rounding at the POS will cause to their bottom line. The government estimates that the rounded transactions will be a wash – half of the transactions will round up, half will round down and you’ll be at a net of zero. They also claim that businesses will save money in not having to handle and count pennies anymore. I doubt all of this highly. Nothing that government ever does saves small business money – you can take that advice to the bank. Obviously the answer to this question depends on the kind of business you have. If you’re a fine dining restaurant where the average transaction at the POS is $125 or more, penny rounding will have a minimal impact on your business. Two cents on a $125.00 transaction would represent 0.00016% of the transaction. 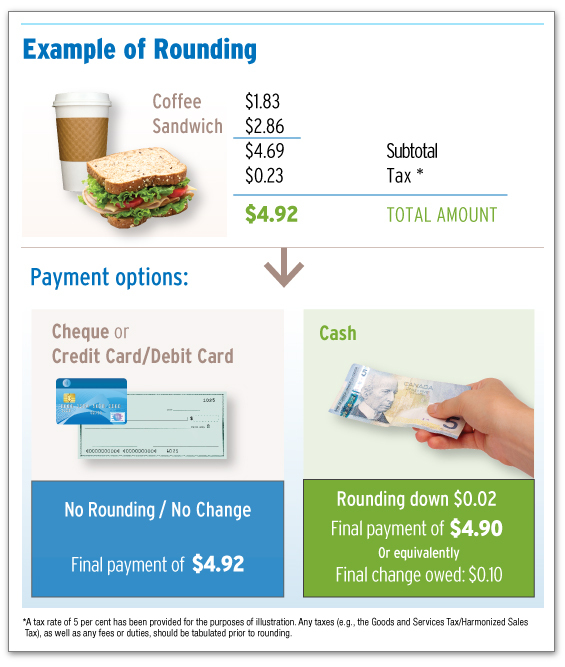 If you’re selling coffee and donuts and the average transaction at the POS is a buck or two, penny rounding may be a serious consideration for you and your business. Two cents on a dollar is 2% of the transaction. If your pricing strategy and the average basket of items purchased at the POS by consumers hits a couple of magical numbers, you could find yourself on the losing end of the penny rounding to the tune of 2 cents on a majority of transactions. On the other hand, you could be on the winning side to the tune of 2 cents just as easily. What you need to do is track a sample of transactions in your business and determine the average loss or gain caused by the penny, and make a decision based on your analysis. The bottom line is this – if you’re in a penny pinching business – a business where the majority of transactions are less than or equal to no more than $1-2 then the penny might matter to you. A potential 2% difference for a convenience store, dollar store, or coffee shop could have a large enough impact. If it’s a chain then simply multiply the impact by the number of stores. So on the surface, the penny change at the POS doesn’t seem like such a big deal. But as you look closer at the issue from the perspective of specific merchants, you begin to understand the problem. Should I change my cash register or POS system? Armagh POS has ensured that its clients have access to POS systems and cash registers that can automatically round the change on cash transactions to the nearest nickel in order to provide a more consistent method to cashiers and transparency for customers. Our retail POS software, Catapult, and our restaurant management POS, Digital Dining, both are capable of rounding to the nearest nickel thanks to some software revisions to handle the new policy. For those customers looking for traditional box cash registers that can handle penny rounding, Armagh also offers the Casio TE-2200 and TE-2400. That being said, the government of Canada has said that there is no need for retailers and restaurant owners to change their POS software or cash registers. However, that’s easy for them to say. These days it’s hard enough for businesses to hire competent staff that can count much less round off transactions at the point of sale to the nearest nickel on the fly. The uncertainty caused by penny rounding is an issue that a chain of any size will have to deal with directly so that cashiers, servers, and bartenders will know what to do when they run out of pennies. My recommendation on this depends on the kind of retail or restaurant business you own, your average transaction size, the number of cash vs. electronic transactions you have, and whether or not you are a chain. If you have a retail store or restaurant that doesn’t do a lot of cash transactions, and so rounding change to the nearest nickel is an exception, not a rule, then you shouldn’t worry about changing your POS system. The impact on your business is minimal. Just teach your staff how to round to the nearest nickel. If your business has an average sale that is high enough so that losing 2 cents on every cash transaction would have less than a fraction of a percent impact on your business, then you shouldn’t panic about the penny either. If you run a business where the average transaction is less than $10, or cash transactions are a majority of the sales, and or you run a chain and the multiple rounding transactions and uncertainty could cost you some serious coin, you should update your POS system or find a cash register that can handle the penny. Here’s where the math gets you though. If you’re operation does 1000 transactions on a busy day, and each was out 2 cents, potentially you could be out $20. If your cashier came to you with a till that was light by 20 bucks, would you question her on it? If the answer is yes, and you do that kind of volume on a daily basis, you should probably do something about your point of sale. The only constant in business is “change”. I started with a pun, I’ll end with one too. Do I think the penny is going to be a huge panic for retail stores and restaurant businesses at their POS? Absolutely not. Bars, pubs, nightclubs, and some restaurants have been rounding to the nearest nickel (I’ve heard even to the nearest quarter in some places) for years. I’m sure the simplification of the denominations will allow for some efficiency eventually when everyone gets used to the change. The key to surviving this business challenge is the same as all the others – good information and planning ahead. For some of you that will just mean some simple rounding. For others it may mean a software patch for your POS software to handle the rounding. For some, it will mean a new cash register. For some additional reading on this topic, I highly recommend the Canadian Federation of Independent Business. The federal government also has some information and guidelines phasing out the penny at the POS on their website. And that’s my 2 cents… er… nickel’s worth.